John Barleycorn Must Die is a traditional English song - records of its origins go back as far as the 1300s, and it is probably much older than that. Over time, many variations have arisen, and the Scottish poet Robert Burns wrote his own famous version of the story of John Barleycorn. 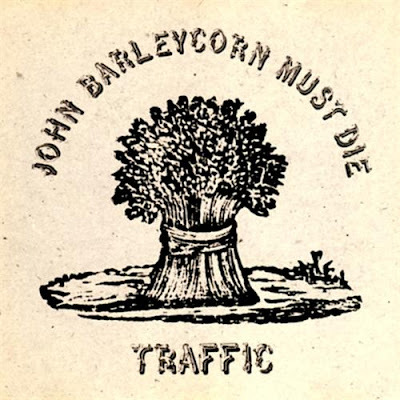 In the 70's, John Renbourne, Traffic, and Steel Eye Span popularized the song, along with many other folk artists of the time. 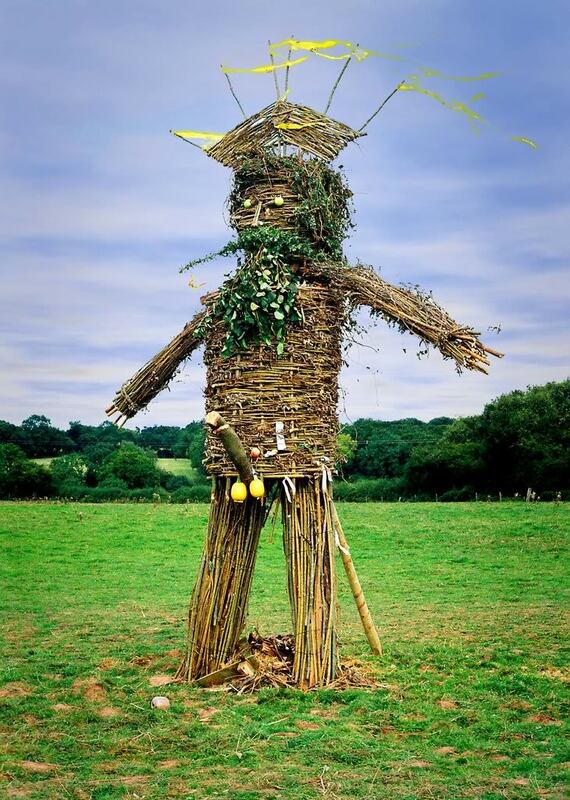 John Barleycorn is a very ancient, prime myth indeed - the Great King who is sacrificed, dies and is reborn in the spring as the wheel of the year's agricultural cycle turns. In many pre-Christian cultures, this motif is found as the Sumarian God Dumuzi, the Shepherd husband of the Goddess Inanna who goes into the underworld for part of the year, and returns to her in the Spring. The same idea of the dying and reborn King is found with the Egyptian Osiris, who is reborn in his son, the Sun God Horus. 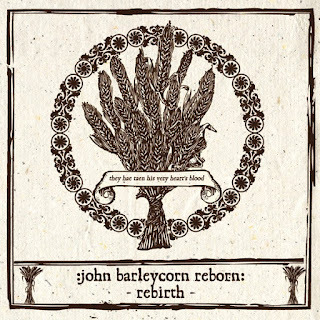 John Barleycorn is the personification of the grain, and the life of the grain from planting to harvest, transformation into beer, and then sowing. 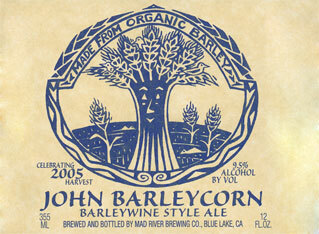 After Barleycorn’s first death he is buried, and laid within the ground. In midsummer he grows a “long golden beard” and “becomes a man”. 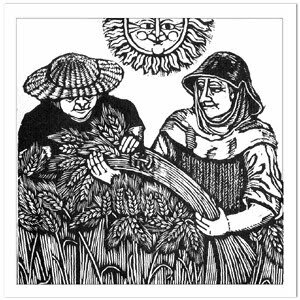 The songs of John Barleycorn go on on to describe threshing and harvesting. Barleycorn is bailed and taken to the barn. And then the grain is parceled out. Some is taken to the miller to make flour for bread. And some is saved and brewed in a vat to make ale. And some is planted, so that the whole cycle can begin again. 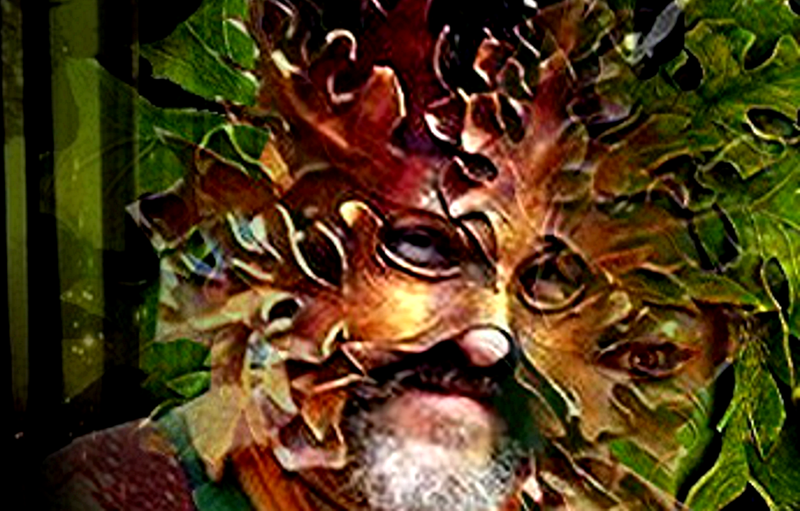 It is likely that versions of John Barleycorn songs go back to pre-Christian times, the accompaniment of harvest rituals at Lughnasash, in August, or Mabon, the Autumnal Equinox. It might be noted that John Barleycorn is, in particular, also a God of Ecstasy - because he provides celebration and ecstasy as the barley becomes the source of beer and the beloved malt whiskey of the Highlands. He shared a style not unlike the more Mediteranean temperment of Bacchus, the Roman God of wine. 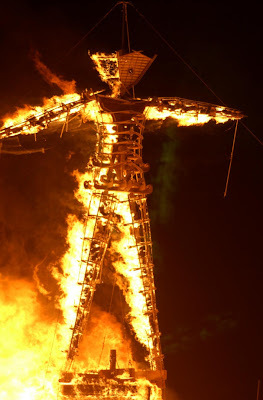 The malting and fermentation of the grains that form his body is also a part of his "life cycle" and divinity. 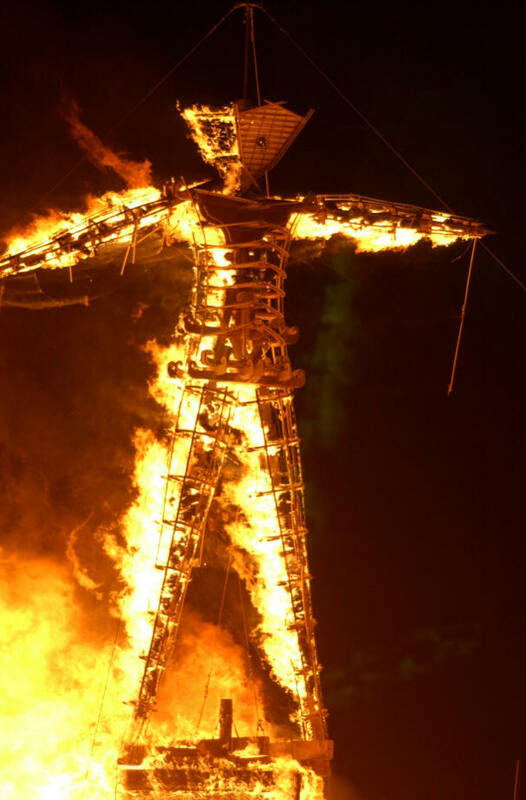 Perhaps one of the most famous "ecstatic" manifestations of the Wicker Man, his rituals of sacrifice, rebirth, and celebration is Burning Man, the "harvest" festival that happens in Nevada every fall. It's interesting that in Robert Burn's poem, there are "three kings", similar to the kings from the east in the Nativity story. Early Christians who came to the British Isles (and elsewhere) often absorbed native pagan mythologies and traditional rituals into Christian theology, and the evolution of the Story of Christ is full of such imagery in order to help the natives accept Christianity. 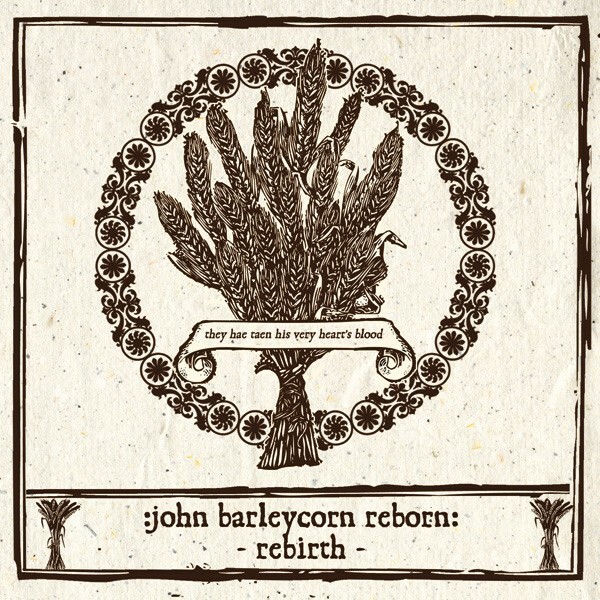 Certainly John Barleycorn shares with the Christ Story the ancient theme of the death and rebirth of the sacrificed agricultural King. I am a great admirer of the wisdom traditions of Gnostic and esoteric Christianity, but I also believe it is necessary to separate the spiritual teachings of Christianity from the mingling (and literalization) of earlier mythologies in the development of the Church. For example, I believe the metaphor used to describe Jesus as the "Lamb of God" directly relates to Biblical practices prevalent in his lifetime of sacrifice of lambs and goats to Yahwah. The later development of the doctrine that Christ "died for our sins", may have some of its origins in the important, and quite ancient, Semitic Scapegoat Rituals. But observing recently a Catholic "Communion" ritual ("This is my Body, This is my Blood") I was impressed by the many layers of mythologies and archaic cultures inherant in that ceremony, still important to so many people today. And one of those threads may very well originate in the prime agricultural myth of the dying and reborn God, a long tradition from which John Barleycorn dies now at Harvest, and arises re-born every spring. Love it! I didn't know the history, either. Fascinating.